While smaller children will find the Tarka large to paddle and manoeuvre, this kayak is great for older children and teens. Tiny tots will enjoy sitting in the spacious tankwell. The Tankwell has enough space for more than one small dog and a medium to large-sized dog. If your dog prefers to sit, rather than to lie down, line the tankwell with a foam mat to prevent their paws from slipping. On flatwater, the Tarka is fast and agile. 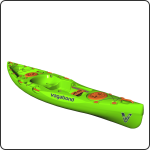 It offers both speed and comfort whether you’re paddling for recreation or exercise. The Tarka is a great kayak for touring for smaller-sized paddlers. It has decent speed, good stability, comfort and storage space for multi-day trips. Although this regular Tarka model is great for kayak fishing, if angling is your sport we would recommend that you consider the Tarka Angler version, which comes with Rod Holders, Deck Rails and an Anchor Trolley. The Tarka performs on the sea. Its hull tracks and will ride the swell with ease. On your next sea-side holiday, enjoy paddling from one side of the bay to the other – just be sure to take snacks and drinks; distances across water can be deceiving (and are usually farther than you expect!). Although the Tarka will get you out through the breakers and back in to shore in style, you won’t win the Surf Kayaking World Series with this kayak (for that you’ll need a Dumbi, our surf kayak). Enjoy taking your Tarka tripping down rivers with small rapids and scenic flatwater sections. Use the 8″ Screw Hatches and Tankwell to secure gear for overnight trips. If you plan to do trips with bigger water and rapids, rather consider one of our whitewater kayaks like the Usutu sit-on-top. Our Stand-up Platform is a winner. It makes it easier for you to get in and out of this kayak. While we don’t recommend paddling the Tarka from a standing position, you can stand, stretch your legs and enjoy a height-above-water view to check out your surroundings, while you’re out on the water.